The BBC’s weekly The Boss series profiles a different business leader from around the world. This week we speak to Ethan Brown, the boss and founder of vegan food company Beyond Meat. Ethan Brown’s 12-year-old son eats a burger almost every day. It may not sound like a diet a parent would want for their child, but Mr Brown has no concerns, because the burger patties come from his own company, Beyond Meat. And they are made entirely from plants. Mr Brown says he is on a mission to redefine the word “meat”. The 40-something’s Los Angeles-based business makes vegan burger patties, chicken strips and sausages from plant proteins. They are formulated to mimic the taste, texture and look of beef, chicken and pork. Stocks of the company’s flagship Beyond Burger product quickly sold out after its launch in the US in 2016, helped by a positive article in the New York Times. More than 25 million Beyond Burgers have now been sold, and earlier this summer the company launched the product in the UK and mainland Europe. Meanwhile, high-profile investors include Microsoft’s Bill Gates, Twitter founders Biz Stone and Evan Williams, and the actor Leonardo DiCaprio. “There’s no mystery to meat,” says Mr Brown. “It’s amino acids, lipids, trace minerals and water. Before launching Beyond Meat in 2009, Mr Brown worked in the alternative energy sector as a hydrogen fuel cell developer. While he says he liked the work because of its potential for lowering vehicle emissions, he felt he could make a bigger contribution to society by focusing on trying to reduce the environmental impact that livestock has on the planet. He also wants people to eat less meat for animal welfare and health issues. So Mr Brown set up Beyond Meat, and began researching how you can use plant materials to replicate the composition of the proteins and fats in meat. Getting in touch with scientists at the University of Missouri who were doing research on plant-based meat substitutes, he began working with them on creating a viable product. The first product that Mr Brown and the team of scientists came up with was Beyond Chicken Strips. After repeatedly phoning grocery chain Whole Foods, “almost to the point of indecent behaviour”, he says he managed to get a meeting that resulted in the store stocking the product from 2013. However, Mr Brown wasn’t happy with the early recipes. So with his team of biochemists, biophysicists and biomedical scientists he got to work on making products that were even closer to real meat. Along with improving the formulations, Mr Brown says that his biggest challenge was getting people to stop thinking of them as “fake meat”. The best-selling Beyond Burger patties “bleed” like beef burgers, thanks to the addition of beetroot juice. They also include pea protein, coconut oil and potato starch, and the company asks supermarkets to stock them beside the raw beef products in the chilled counters. The product is now stocked by 8,000 supermarkets across the US, and in thousands of the country’s restaurants. In the UK it is served at burger chain Honest Burger. It was also due to be on sale at supermarket chain Tesco from last month, but that has now been delayed until later in the year. Beyond Meat says it’s because it was struggling to keep up with existing demand, both in the US and overseas. Consumers are clearly coming round to the notion of plant-based meat substitutes that aim to look and taste like the real thing. More than a quarter of Britons (26%) say they find the idea of such products appealing, according to research group Mintel. “[This] puts companies like Beyond Meat in a strong position to capitalise on the current interest in limiting meat intake,” says Mintel’s UK food and drink research director Kiti Soininen. But just how good, or otherwise do the company’s products taste? A trawl of online food blogs show that the reviews are broadly positive. But while some reviewers say its burgers taste unnervingly like real beef, others say they definitely don’t. 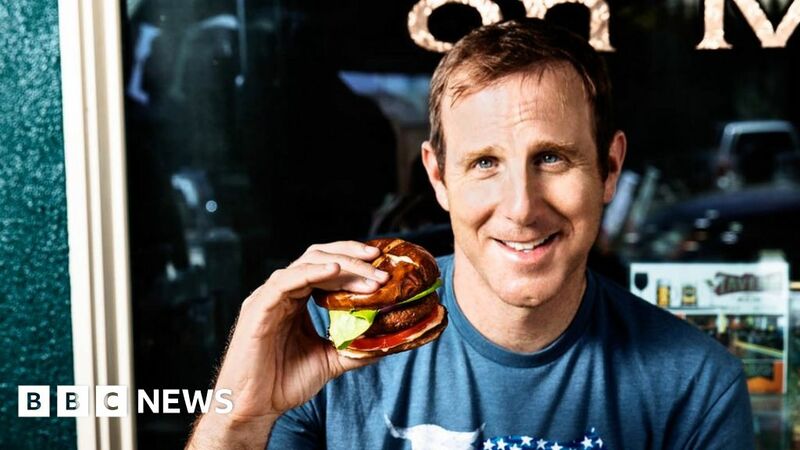 While Beyond Meat now has many rivals, including US start-up Impossible Meat and the UK’s Moving Mountains, Mr Brown says that Beyond Meat is struggling to keep up with demand. “We’re trying as hard as we can to catch up,” he says. The company, which started with just 10 people operating from a kitchen in a former hospital, now employs about 200. And it has just opened its second production facility in Columbia, Missouri, which it says will create a further 250 jobs. In addition, it has launched a new research lab in Los Angeles. This expansion has been funded by external investment in the business that now totals $72m (£56m). Mr Brown won’t reveal what stake he retains in the company, but calls it a “decent share”. Mr Brown, who spent his childhood outside Washington DC, says he approaches every working day like it’s an athletic event – eating well, exercising and meditating. At work, he admits, his focus is intense, and there’s “not much chitchat time”. “I tell my son this all the time,” he says.